Happy Birthday to my father-in-law Tony! Today – May 16 – is my father-in-law’s birthday. And while it’s probably a stretch to say he got the best son-in-law he could possibly imagine, he’s definitely getting the best birthday-gift-from-a-son-in-law he could possibly imagine: bike-written birthday wishes! I doodled the flickering flame on the birthday candle in a mall parking lot (at a little after 6:00 a.m., when it was empty of cars). 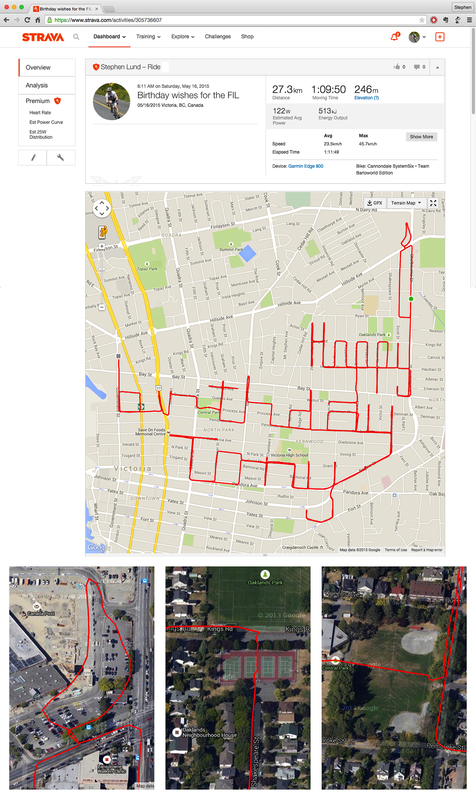 The rest I wrote in once continuous line – mostly on roads, except for a little jaunt through some tennis courts for the second p in ‘happy’ and some off-roading across a baseball field for the tail of the r in ‘birthday’. 1 Response to Birthday wishes for F.I.L.